George was the second child of Holden and Jennet Turner. Born in the early days of New Brunswick in rural Fredericton, he became a stage driver and proprietor of a transportation and cartage concern with stables, horses and employees. For more than 30 years, George provided a cab service for members of the House of Assembly of New Brunswick in Fredericton. He may have been the first of many New Brunswick Turners to be involved in horse-drawn transportation. He and wife Catherine Russell had nine children, including two who followed him into stagecoach transportation and two others who were involved in sea-going transportation. George and Catherine also adopted and educated two young "Blue Coat Boys" from England. In 1833 he built a house at the corner of Regent and George Streets in Fredericton. It is still standing, has been completely renovated, and is now classified as one of 24 buildings forming Fredericton's architectural heritage. Catherine died in 1841 and George remarried the following year to Mary Harned McBeath, a widow. George died on May 22, 1860 and was buried in the Old Burial Ground. He was highly respected in his community, a man mourned widely at his death. This notice from The Head Quarters of May 23 1860; George died May 22nd and his grandson John, drowned on May 12th. Table of contents, forward, coats of arms, introduction, structure, acknowledgements and bibliography. Holden was our first Turner ancestor to settle in Canada. This chapter covers his early years, settlement and life in the Fredericton area. 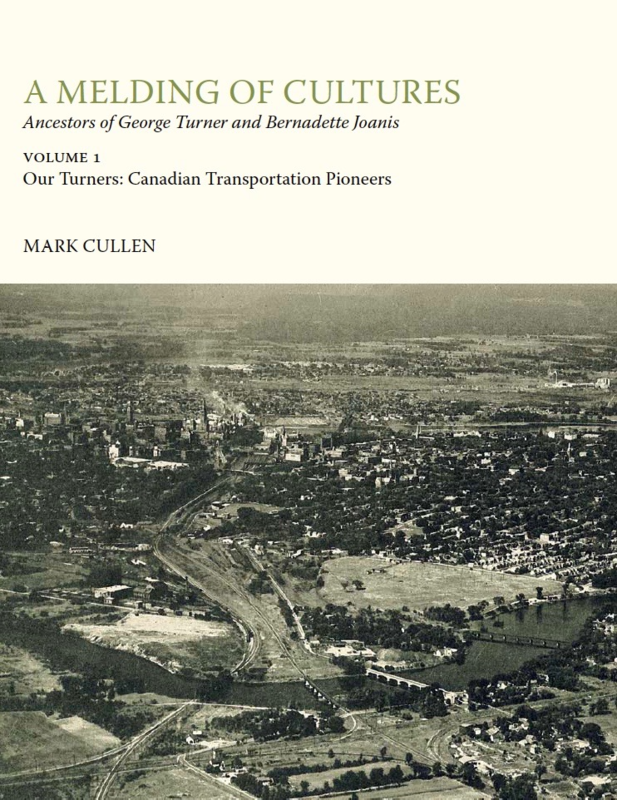 Excerpt from A Melding of Cultures Ancestors of George Turner and Bernadette Joanis Volume 1 Our Turners: Canadian Transportation Pioneers, Mark Cullen, Vancouver, 2013, pp 1-11 plus notes and appendices. Chart showing the 7 generations from Holden Turner to Mark Cullen. Holden was the first of the family to settle in Canada in 1783. [S31] Jennet Turner Petition to N.B.House of Assembly 27 Jan 1845. [S208] New Brunswick Courier, Saint John, April 30 1842.